Greek Bites is our go-to takeout place when we are in the mood for Greek food. Even though its not a regular restaurant, they have a full menu from soups and salads, appetizers, sandwiches and wraps, entrees/platters and desserts. If you're traveling east on Montauk Hwy, it could be easy to miss since its a little hidden from the street but if you're traveling west, it's in plain sight. There is plenty of parking around the entire place and I highly recommend calling your order in ahead of time since it gets very busy during the dinner rush! If it's a nice day, you can sit outside at one of their tables just outside or even under the trees next to the parking lot. All the food we've tried has been great, from a simple greek salad to chicken souvlaki and their gyros, avgolemono soup and their very garlicky skordalia. No matter what greek dish I'm in the mood for they have it and their tzaziki sauce is very good. Every now and then we get dessert when we know we'll be heading directly home. They make these ice cream truffles that are absolutely delicious! There are almost 20 flavors to choose from like the Manhattan Truffle which is similar to an italian tartufo. Our favorite is the Chocolate Mud Pie Gelato Truffle! My only issue with Greek Bites is that despite their awesome food, we always seem to spend so much, BUT we do end up very full! I think no matter where you go for Mediterranean food, it's always overpriced so its not really a surprise. It obviously doesn't deter us since we come back time and time again! 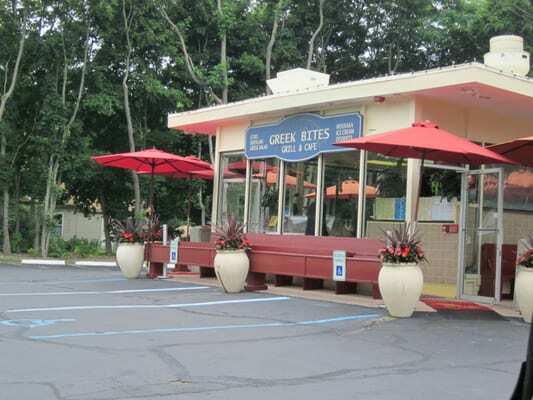 If you're in the mood for some tasty Greek food or even just some delicious ice cream in a new way, check out Greek Bites!